Maxon Motor have launched a range of brushless DC motors with integrated electronics. The range of drives includes EC 20 flat, EC 32 flat and EC 45 flat with in-built speed controllers. 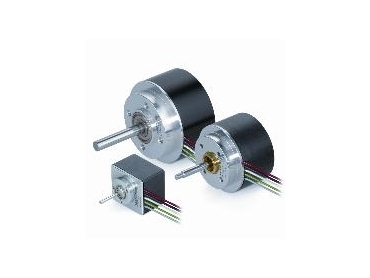 The motors available as standard are the 2 and 5-wire versions, with an operating range of 2 to 50 watts. The drives are suitable for use where there is minimal installation space, when long service life and constant speed are required at the same time as simple control operations. Maxon Motor have been developing and distributing brushless flat motors for many years. These are known as external rotor motors where the rotating rotor shell encloses the fixed stator. Advantages of this design include its short overall length, high torque density and its simplicity. The new EC 20 flat, EC 32 flat and EC 45 flat motors with integrated electronics also reduce the user’s need for control input to the minimum. Current commutation is integrated in the motor through Hall sensors, a 1-quadrant speed controller and numerous protection functions. Motors are available as 2 and 5-wire versions. In the 2-wire version, speed acts proportionately to the applied operating voltage of 10 to 28 volts. In the simplest case, the drive is powered directly by the battery. The 5-wire version offers additional functionality and a wider operating range with set value input, enable and speed monitor. Current limitation, under and over-voltage switch-off plus temperature monitoring are implemented as standard in all models. New models are also being added to the existing range of flat motors, such as the EC 20 flat, which is available in a 5 watt version, with or without Hall sensors, as required. The EC 90 flat is now available with integrated electronics due to the two-channel encoder with 2,048 pulses per revolution, making the drive ideal for challenging positioning tasks. A protective cover shields the unit against contamination which means that it can be used in rough environments. Maxon Motor’s flexible modular system has also been expanded, so that all flat motors can now be combined with spur and planetary gear heads.